Playground-building Colts go to the Super Bowl! Sunday was a great day to relax and watch some football, with teams battling for the chance to play in the Super Bowl on Feb. 7. A round of congrats are in order for the Indianapolis Colts, who will try and win their second Super Bowl in the last four years after beating the New York Jets in a come-from-behind 30-17 victory yesterday! The Colts are great champions for the cause of play, having partnered with KaBOOM! to build playgrounds in each of the last two years. Thanks to the generosity of the Colts, National Starch and Lucas Oil, the students at Eliza Blaker School 55 in Indianapolis now have a great, wonderful place to play. On Sept. 29, 255 volunteers took time out of their schedules to build a brand new playground that serves the 300+ children who attend the school. Several Colts players, including Hank Baskett, Kyle Devan, Jamie Silva, Jordan Senn, and Pierre Garcon were on hand to help build the playground. 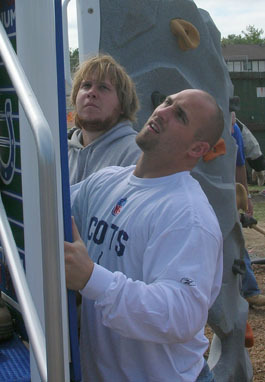 In 2008, the Colts and National Starch partnered with KaBOOM! to give the children at Daniel Webster Family Academy a great place to play (video here). It was almost an “all-KaBOOM!” Super Bowl matchup this year as the Minnesota Vikings, who have built four playgrounds with KaBOOM! and The Toro Company, lost in overtime to the New Orleans Saints 31-28. More fun will come this week as NFL Commissioner Roger Goodell and several NFL players will join hundreds of volunteers for a playground build on Thursday in South Florida in conjunction with the NFL PLAY 60 Community Blitz. Taking place prior to the Pro Bowl (Sunday, Jan. 31), the NFL PLAY 60 Community Blitz is the largest community program in the league’s history. NFL PLAY 60 is designed to tackle childhood obesity through programming, grants and media time for public service announcements. I think it goes without saying that no matter who your team is, NFL PLAY 60 is something we can all cheer for!